6.5.1 Timeline - Read a timeline and order events of the past between prehistory and the Renaissance. 6.5.2 Types of Communities - Recognize the types of early communities (i.e., nomadic, fishing, and farming). 6.5.3 Identify Artifacts - Identify types of artifacts by pictorial representation (i.e., Egyptian, Roman, Greek, Chinese, Native American, Medieval, and Renaissance). 6.5.5 Technological Advances - Identify major technological advances (i.e., tools, wheel, irrigation, river dikes, development of farming, advances in weaponry, written language, and printing press). 6.5.6 Time Designations - Recognize the designations for time dating (i.e., BCE, AD, centuries, decades, prehistoric, and historic). 6.5.7 Major Time Periods - Recognize major historical time periods (i.e., Early Civilizations, Classical Period, Dark Ages, Middle Ages, and Renaissance). 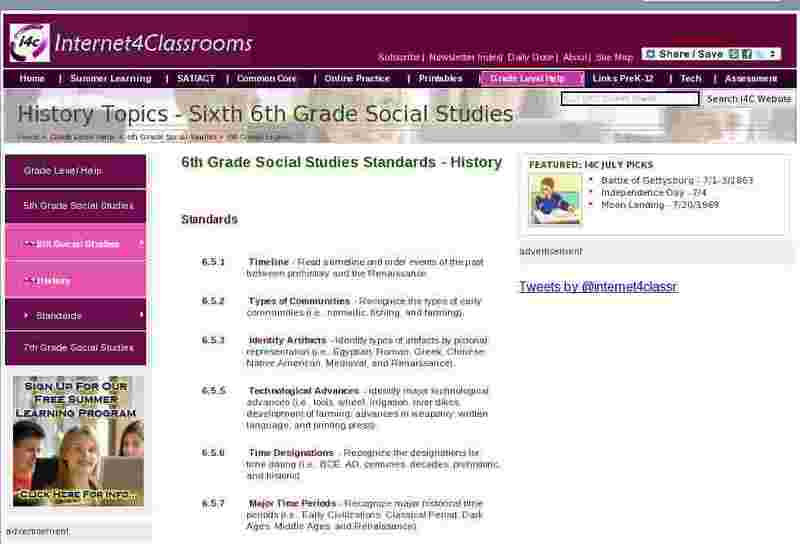 6.5.8 Primary Sources - Identify conclusions about early world historical events using primary and secondary sources. 6.5.10 Language - Identify the development of written and spoken languages (i.e., Roman alphabet, Latin word origins, Romance Languages). 6.5.11 Characteristics of Society - Identify characteristics including economy, social relations, religion, and political authority of various societies (i.e., Mesopotamian, Egyptian, Greek City-States, Roman Empire, Indian, and Medieval). 6.5.12 Causes of Change - Recognize the possible causes of change in civilizations (i.e., environmental change, political collapse, new ideas, warfare, overpopulation, unreliable food sources, and diseases). 6.5.17 Mythology - Recognize the significant mythologies of the Sumerians, Egyptians, Greeks, and Romans.